This program was designed to empower communities to care for their sick. It was introduced after the arrival of the HIV and AIDS pandemic in Swaziland. Caritas Swaziland has joined hands with the Ministry of Health against Tubercolosis through the generous support from Southern African Catholic Bishop’s Conference ( SACBC). According to our last report in December 2014, 30 369 clients have benefited through training and nutritional support of supplements on a monthly basis. The statistics represent two parishes Regina Mundi and Good Shepherd where the TB Program is being implemented. Caritas also committed its self in addressing the pandemic after the Prime Minister of Swaziland in March 2011 had declared TB as a national pandemic. The program has been able to fulfill the mandate of the church by working with 28 Community Care Givers and 2 Coordinators. There are 13 community care supporters who conduct the home visits in this Parish and its outstations. 151 clients receive nutritional supplements every month. 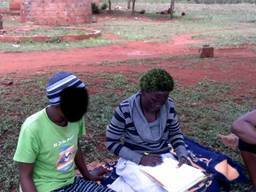 The care supporters were incentivised with a monthly stipend of E 1, 000.00 and they also received monthly trainings facilitated by a nurse from Good Shepherd Hospital who joined hands with us in the fight of this TB pandemic. Caritas was able to do all the work through funds she received from SACBC on monthly basis. Community health workers are now recognised by the community members.